Copyright © 2000-2002 Angela Chang. All rights reserved. The idea was to design a communication device with minimal distraction so as to reduce the effort in communciating with a loved one. Our design team came up with a digitally augmented picture frame that allowed effortless communication by adding internet connectivity to a sentimental object. Current day communication devices require lots of effort and attention, particularly with increasing bandwidth and connectivity. This creates mental strain and unnecessary grief for couples who communicate often. Our team believed that one should have an open, subtle connection to their significant other... and found that picture frames could signify this emotional connection. 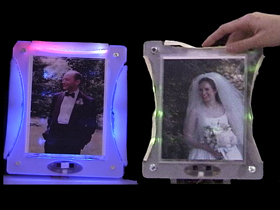 By using the combining the subtle qualities of light with the personal meanings of touch, we came up with a device that could help couples answer the question "Is my loved one there?" and "Are they thinking of me, too?" We decided that the device would have to be feasible to build and subtle, fitting in unobtrusively with a user's existing surroundings. 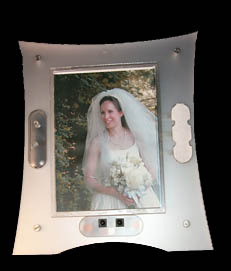 The picture frames are designed to be sold in pairs. 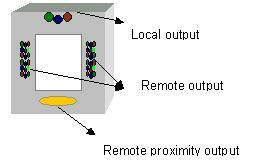 Each user connects the frame into their computer and runs an application that allows access to the corresponding frame. There are two interactions: passive and active. 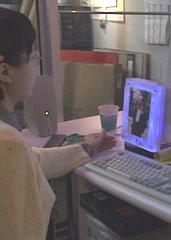 In passive mode, the user merely has to move in front of their picture frame to cause the other person's picture frame to glow. This signifies that there is a presence. In active mode, the person can squeeze and light up the other person's photo. 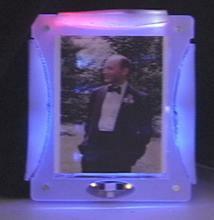 The picture frame provides a feedback display so that the sender can see the lights they are pressing. Our team designed a touch-to-light interaction to serve as the communication medium. The current state-of-the art consists of force sensing resistors, IR proximity detectors, Java software that translated serial to TCP/IP, a custom-designed circuit and artistically lasercut picture frames. The paper was accepted and presented at CHI2001, and is currently on full demo at the Tangible Media Group at the MIT Media Lab. We estimated that in production, the device would cost about $20 each.